Note: Representatives of the Aramean movement are disappointed in Patriarch Aphrem II. 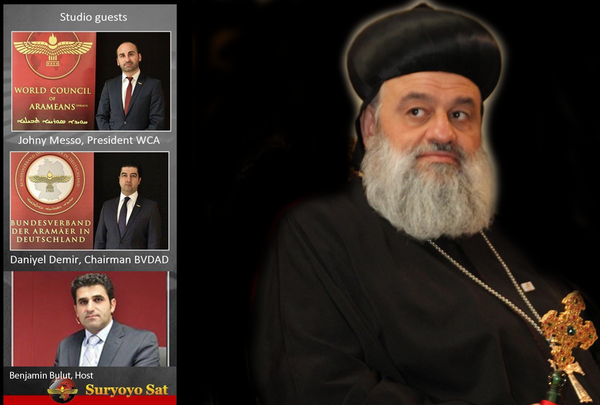 In a live program in Suryoyo Sat on May 20 they questioned the Patriarch's classification of the Aramean faction as one of many political parties within our group. The anti-Assyrian movement that for four decades has used the church as a tool has begun acting desperately now that the new Syriac Orthodox Patriarch Aphrem II Karim has begun treating equally all political organizations consisting of members within the Syriac Orthodox Church. Aramean representatives recently boycotted the Patriarch's meetings in Germany. One of them also tried to berate Patriarch Aphrem II at a press conference, which can be seen on Assyria TV. Since the late 1970s, when the Assyrian movement began gaining ground, the leadership of the Syriac Orthodox Church collaborated with anti-Assyrian forces and built a movement that eventually established the Aramean term as their ethnic identity. Influential bishops have played a crucial in supporting this Aramean movement and it has benefited from the church's strong position among the people and used the church as a tool for its policy of divide-and-conquer. The Aramean faction has thus been privileged in the church and has raised an entire generation that denies any connection with the Assyrians, including a number of monks who today are bishops in the Syriac Orthodox Church. But now the church has a new Patriarch who does not accept that God's house be used by destructive forces who create divisions within his people. He declared it in his inaugural speech when he made clear that the Church's single symbol is the Cross. No other flags are allowed. Admittedly, some Aramean flags are still swaying on certain church buildings, mainly in Sweden, but the Patriarch seems be keeping a consistent position, which means that it is probably a matter of time before these flags will disappear from the church areas. In any case, this must be the consequence of the uncompromising line for unity that Patriarch Aphrem II Karim is promoting. Representatives of the Aramean movement are uncomfortable with Patriarch Karim's edicts and show a clear dissatisfaction with his attitude in the matter. The Patriarch and the Synod also need to put a stop to the bishops who spread a virulent anti-Assyrian propaganda and openly show their sympathy for the Aramean faction. One of them is Bishop Benjamin Atas in Södertälje. Another is Bishop Malke Urek in the city Adiyaman in Turkey. On May 20, 2015 Suryoyo Sat broadcast a live program with Johny Messo, Chairman of the World Council of Arameans (WCA) and Daniyel Demir, Chairman of the Aramaic Federation in Germany. The theme was to follow up the discussion at the press conference with the Patriarch Karim. In the advertisement of the broadcast the host Benjamin Bulut wrote "Unity?" Where he was questioning the Patriarch’s call for unity. No phone calls from viewers were allowed, but Bishop Malke Urek was on the line and spewed his bile on all the Syriac Orthodox Church members who call themselves Assyrians. He called them heretics and enemies of the “Syrianity.” The entire program was a showcase of classical Aramean manipulation of viewers, by constantly equating the terms Suryoyo and Oromoyo. All participants were in agreement that the so-called Arameism is an ethnic identity that is indisputable and the Patriarch, therefore, is wrong when he calls the Aramean movement a regular party among our people. The only thing from the press conference they showed was the part where the Patriarch Karim commnets the Chaldean Patriarch Luis Sako’s proposal for a common term for the name of the people in the KRG constitution, where Patriarch Karim says he has nothing to object against the name Arameans if all parties agree that it can create unity among our people in Iraq. Regarding the use of the Aramean flag in churches, Johny Messo wondered why the Syriac Orthodox Church does not follow the example of East Assyrian Church which is using the Assyrian flag in all contexts within the church. He says thit while the Patriarch Karim wants to ban all alien symbols in the church, including the Aramean flag. Johny Messo’s family is not even members of Syriac Orthodox Church, but Lutherans. Two days later the Patriarch held a press conference for all three TV channels operating within Syriac Orthodox Assyrians, namely Assyria TV, Suryoyo Sat and Suroyo TV. When it came to Benjamin Bulut’s turn, of Suryoyo Sat, he tried to lecture the Patriarch because of his equating the Arameans with Assyrians. Instead of asking relevant questions, he argued with the Patriarch about the importance of using the Aramean term as a generic name for our ethnic identity. He does not consider Suryoyo (which Patriarch translates into Syriac) as an identity-bearing term. Benjamin Bulut: "When I consider Your Holiness, I imagine that you are sitting on the same chair as the Apostle Peter and his successors, church fathers and masters, such as Mor Afrem, Ignatius Nurono, Mor Severios, Mor Mikhael Rabo. But today I hear something from a Patriarch sitting on the Apostolic See that I've never heard before. I can not say if it's good or not. But as a son of this people, I have difficulty understanding how one can speak about parties. I personally can not understand this statement. No parties have been formed, whether in the Aramean or Assyrian history. However, federations have been formed under the name of Suryoye, mostly with the assistance of the threefold Blessed Bishop Jeshu Cicek. It is these associations that have built these churches. No one can deny it. They have been established as Suryoye. The people who are Suryoyo and stand behind these church building have a federation. When I say Suryoye I mean clearly that it is synonymous to the Arameans, like all previous church fathers have claimed. The latest among them, Patriarch Mor Ignatius Zakka, has written in his books that no one may distinguish between Suryoyo and Oromoyo. I suppose you manage this better than us. Today this federation is regarded as a political party, which I consider offensive. It is a matter of a people, not a party. Therefore, it is offensive to call Suryoye, i.e the Aramean people (or Assyrians, for that matter), a political party. It is wrong because we are one people. But these two [Assyrians and Arameans] have never been one. Myself, I know that my brother and I are one [i.e., those within the Syriac Orthodox Church who call themselves Assyrians have the wrong name because he regards them as his Aramean brothers]. Your Holiness, when you say "our people with all their names" then the question is do you unite your people or divide them?" Patriarch Aphrem II: "I want to answer your questions by beginning from the end. I never said "a people with all their names." I insist that the people are Suryoye, no matter what they call themselves outside the church. For me all are Suryoye, because we in the church have a Synod decision [November 1981] which says that "Suryoyo" should be the name of the church, the people and the language. Regarding our language anybody who has knowledge of history knows that the Syriac language is Aramaic, and not Assyrian or Chaldean [See here: http://www.aina.org/articles/akkadianwords.htm]. No one can deny this. Therefore it is true if Patriarch Zakka said that about the language. If your question is about the people's names, I have a personal opinion. But as Patriarch, I have a responsibility to follow the Holy Synod's decision and the official position of the church. Outside the church there are different organizations with different names, whether we deny it or not. They are free in their choice of political line as they do not fall under the church's supremacy. Whether we like it or not, they are political parties [gives examples]. We respect their choice of name for their organization. But everyone is welcome as Suryoye within the church sphere. Outside the church, they are free in their activities. However I do not allow that any of these organizations should claim to represent the Syriac Orthodox Church. Different organizations can claim that they represent the people Suryoye. It is their opinion and their right. We are living in the 21st century. Even in our countries of origin, people have the right to such freedom of choice. But I as Patriarch have to take responsibility for the organization of the church. It is true that what I say none of my predecessors have said, since we live in different times. What the apostle Peter said I cannot repeat, because he lived in a different time. Nor can I repeat what Patriarch Afrem I [Barsom] said, because it belongs to another time. We know he had participated in conferences in Europe and said some things and used a particular name, but then he changed his mind and began using a different name. The time and the circumstances demanded it of him. We must be tactful and find what unites us. Today it is the church that unites this people. Within the church, we accept no other name than Suryoyo. Outside each one is free to call himself whatever he wants. However, we want all parties to work together for their people and promote an overall common objective."